Cleveland Concoction's first two years were a blast! 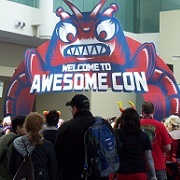 Join me March 11-13 in Cleveland for another fantastic con! Pittsburgh's literary science fiction, fantasy, and horror convention is back for 2016 and super easy to accerss by car--it's right off the PA Turnpike! When I get the chance, I attend the Greater Cleveland Writer's Meetup. If you write and have the opportunity, I highly recommend it for the breadth of experience and for the variety of writing shared. We started a fantasy and science fiction writing group on Cleveland's East Side: Body Count Writers. Don't miss the Body Count Blog! Scifi, Gaming, Comics, and More! I've been testing the promotional waters at the following cons: Confluence (2005, 2009, 2011, 2014, 2015), InConJunction 2013, Starbase Indy 2013, AwesomeCon 2014, Cleveland Concoction (2014, 2015), and DragonCon (2014, 2015).